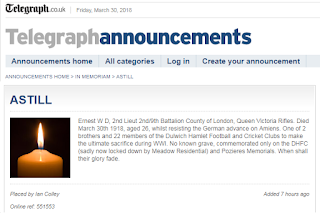 Two men associated with Dulwich Hamlet in its early years were the brothers Reginald and Ernest Astill. Neither played for the first team but each one represented the Dulwich Hamlet Cricket Club, which contained a good number of the club’s senior footballers. Reg and Ernie were regarded as excellent cricketers and a mainstay of the side. Like most of their sporting colleagues at Dulwich, when it was time to serve the nation in the First World War, they did not shirk their responsibilities. Tragically, they were both wounded on the First Day of the Somme, 1 July 1916. Reg, aged 21, was mortally wounded going over Gommecourt, and became the fifth Hamlet man to be killed in the war. His elder brother Ernie, a 2nd Lieutenant of the Queen Victoria Rifles, who had enlisted at the very start of the war, was sent home to recuperate from his wounds and from shellshock, and returned the following year. Seven months later Ernie also became a casualty of the war. Today, 30 March 2018, marks the centenary of his death. Born in Brixton in 1891, Ernie later moved with his parents and family to Carshalton. It must have been extremely difficult for Mr and Mrs Astill to lose their two sons as they did. They had but two boys – and they gave their all. Neither of them has a known grave but Reg is remembered at the Thiepval Memorial and Ernie at Pozieres. An apt tribute to Ernest William Dearne Astill would have been a few moments of quiet contemplation spent at the War Memorial in the Dulwich Hamlet boardroom at Champion Hill. Perhaps a bunch of flowers could have been placed beneath the bronze plaque where his name is inscribed with the two dozen others who made the ultimate sacrifice. However, Meadow Residential have put paid to this by locking Dulwich Hamlet and its supporters out of their ground. 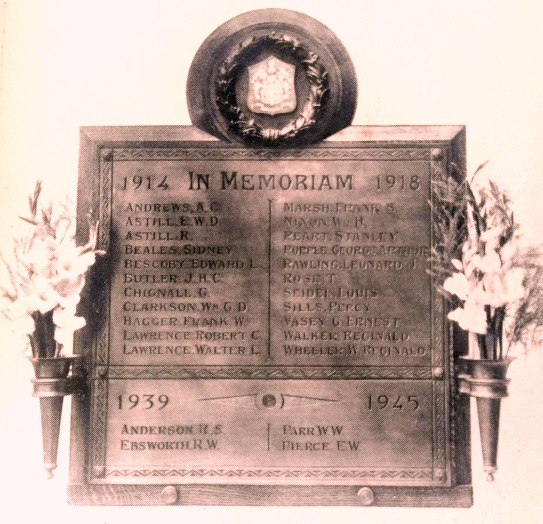 Hopefully by 11 November this year, when we commemorate a century since the armistice, Meadow will be gone and we can hold a proper memorial service. 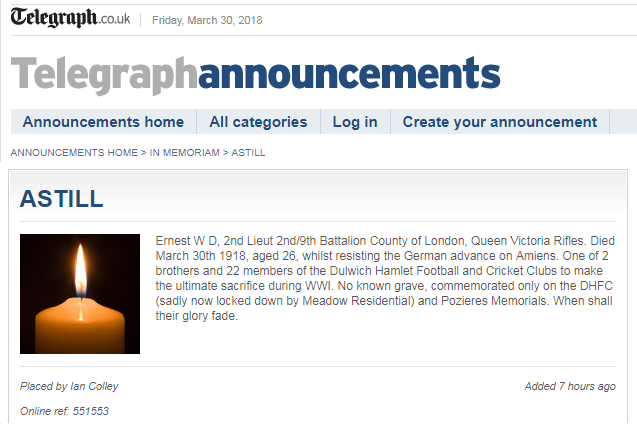 Many thanks to Dulwich Hamlet supporter Ian Colley for placing an announcement in the “In memoriam their name liveth for evermore” column in today’s Daily Telegraph.